We now know when the Limited Edition version of The Walking Dead: Season Six will be released. Anchor Bay announced today shipments would be sold at retailers beginning November 1. MacFarlane Toys wasn’t given much to work with this season, as the show went for quantity over quality and crammed the screen with as many Walkers as possible rather than creating any significantly creative looks. The figure company ended up picking the Walker stuck between two trucks as this year’s offering…certainly a choice, but not a memorable one. The enthusiastic press statement below thinks differently. 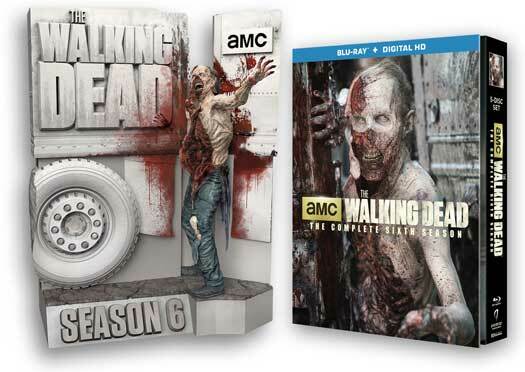 As one of the most highly anticipated annual traditions for “The Walking Dead” fans all over the world, Anchor Bay Entertainment will be releasing “THE WALKING DEAD: THE COMPLETE SIXTH SEASON” Blu-ray + Digital HD Limited Edition set on November 1, 2016. McFarlane Toys has done it again, creating a striking, must-own packaging concept. This year’s Limited Edition features the “truck” walker from the infamous rock quarry in the very first episode of Season 6. Handsomely crafted and intricately detailed, the figurine is based on the original walker designed by award-winning special effects make-up Supervisor and Executive Producer, Greg Nicotero. Packaging also includes a collectible 5-disc Blu-ray set digipack with exclusive “walker” cover art available only with this set. SRP is $149.99, and available for pre-order now on Amazon.com. The vanilla set minus the statue was released August 23.